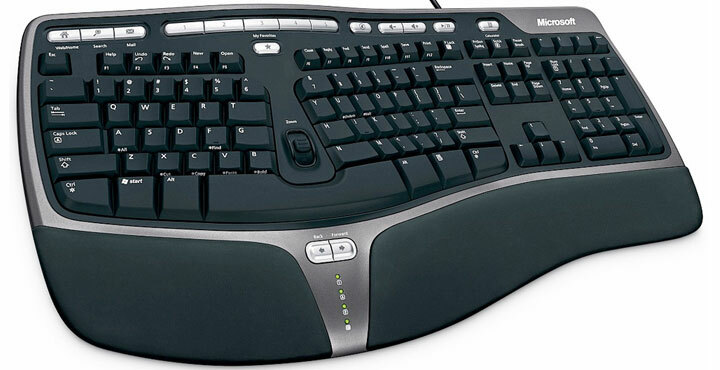 For touch typists only, the MS' ergonomic keyboard may seem awkward, but it looks great and has a feel to match. The wrist rest is literally built onto the keyboard and is not removable, but there’s nothing to complain about it. Why? Its Leatherette cushioning is friggin’ comfortable, by far the best wrist rest I’ve laid palms on. The USB-only Natural Ergonomic Keyboard 4000 does away with the unsightly beige coloring of its predecessors, favoring a sleek black design with silver edges and media keys. Nearly all of the corners are now rounded, including the edges of the 6 and 7 keys and those keys on the leftmost and rightmost sides of the keyboard to present an aesthetically pleasing and modernized look. Like the Natural keyboards before it, this one splits the keyboard in half at a 12º angle to straighten your wrists with the alignment of the keys instead of bending your wrists at an awkward angle and cramming them together like traditional keyboards force you to do. Also, if you take a look at your hands, all your fingers will (hopefully) be of different lengths, the middle finger being the longest of the curved bunch. The rows of keys on the keyboard mimic this in what Microsoft calls a Gull Wing design, subtly curving the keys to better meet the placement of the fingers. Take a look at the two photos below, you can clearly see the difference these adjustments make. It should be noted that the split keyboard design will only work for you if you know how to touch type. Two finger peckists will find the layout slow, and gamers will find that keys on the other side of the split are just too far to reach in the middle of a firefight. If you can touch type however and work in front of a keyboard all day, the Natural Ergonomic Keyboard is more likely to fit your lifestyle. The Microsoft does more than just split the keyboard and curve the keys to try and provide a better typing experience. A lot of the emphasis is placed on elevation. Think about this, when you just plop your hand on a table, it probably doesn’t lay flat, but more likely it sits at a more vertical angle with the thumb raised in the air as if you were about to shake hands with someone. While the Natural keyboard doesn’t quite match this, it does slightly conform to the handshake posture with a 14º angle raising the vertical center of the keyboard. What’s more, Microsoft totally rethought the concept of a raised keyboard. 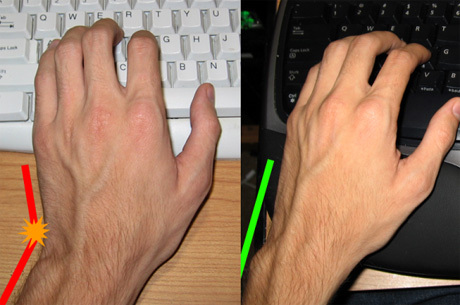 If you know anything about ergonomics (I’m still learning too), it’s always stated that your wrists be flat and not bent upwards. Despite this, many keyboards can be raised at the back using stands and this puts a strain on the tendons under the wrist. 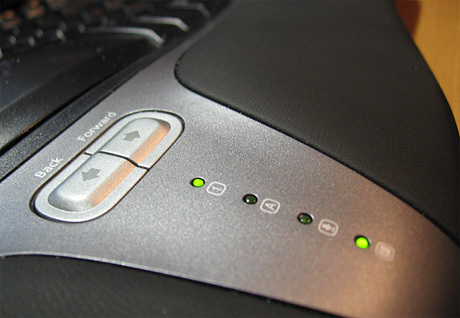 While the Natural Ergonomic Keyboard can also be raised at the rear, there’s a platform that connects to the front of the keyboard to create the exact opposite, a reverse 7º slope. They seem to really be pushing it too, because it’s already connected when the box is opened. Using the reverse slope was very awkward at first, but I noticed two things about it. It forces me to sit upright to reach all the keys, and my arms are in the recommended 90º angle. Strangely enough I’ve come to prefer using the Natural keyboard with the reverse slope over using it flat, although I can no longer shut my keyboard tray because of it. I managed to get a hold of the older Natural Keyboard Pro for comparison, and was able to conclude that the keys are not only much quieter to the touch, but they are also easier to press and travel slightly more when pressed. As such, I find the keys to be more responsive and not nearly as distracting. The Natural Ergonomic Keyboard 4000 ships with the IntelliType Pro 5.3 drivers to control all the hot keys of the keyboard to unlock the potential of the keyboard. At the top of the keyboard the small blue buttons that were present on the Natural Keyboard Pro are now replaced with silver rounded rectangles representing various functions. In the top center of the keyboard are five favorites keys labeled 1-5, not bound to anything by default. Pressing the star key underneath them will open a dialog box to assign each of them the task of opening a folder, file, or website. These can be particularly handy for quickly launching a text editor to take notes or opening a share on the network. In the top left are three buttons for accessing your default browser’s home page, search page, and to launch an email client. On the far right are keys for muting and controlling the volume, pausing the current media player, and launching the calculator. The F-keys also double as enhanced function keys for common office commands, enabled by an F-Lock key next to the F-12 key. Both the regular hot keys and the enhanced function keys can be reprogrammed to perform one of several common commands, launch a program, or website. Just know that pressing Play/Pause will inconveniently bring the media player to front. A few other points of interest about the Natural keyboard is the status indicators have been relocated from the center of the split to make room for a zoom slider, and now lie below the space bar along with new back and forward buttons that can alternatively be reprogrammed to skip through MP3s. The logoff and sleep keys that were above the number pad are now replaced with an extra row of keys including the equals key, start and close parentheses, and a backspace key. Oh, and that evil vertical 5-key arrangement above the arrow keys on some Microsoft keyboards thankfully didn’t make its way to the Natural Ergonomic Keyboard, it’s just the classic 6-key arrangement the way it was meant to be. One curious thing I noticed was the Mac logo on the box. While there are no alternative printings for Command or Option on the modifier keys like on some Logitech keyboards, there is indeed a OS X .dmg install image on the included CD, and the software is very similar to the Windows version, with support for the favorites and multimedia controls as well as zooming. 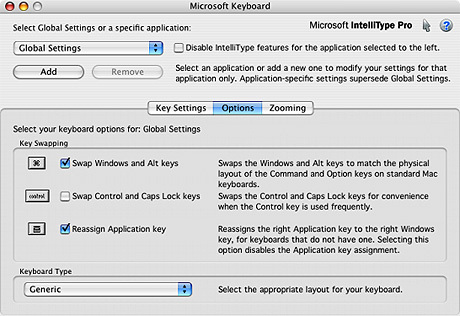 The Windows and Alt (option) keys are switched by default to match the standard Mac keyboard layout, and the right-click key is a hot key that can either be programmed to a keystroke (Cmd-Tab by default), or converted into another Windows key. Support for enhanced function keys is not present, but the ability to have different key assignments per application via profiles is, something the Windows users don’t have. The Natural Ergonomic Keyboard 4000 is a serious keyboard for safety- and comfort- conscious touch typists. Although awkward to use at first especially with the reverse slope attachment, I have found myself able to type for longer periods of time without discomfort and have a better posture when typing as opposed to my usual slouch permitted by any other keyboard. The keys are of good quality and are quiet yet tactile, and the curved gull-wing alignment of the keys conforms to the arc of my fingers rather nicely. The padded Leatherette wrist rest is a blessing from the heavens, and with the exception of the play/pause button the hot-keys are very handy in reducing keystrokes. My only real complaint is the lack of a USB hub. If you know how to touch type and are even the slightest bit concerned with getting Carpal Tunnel Syndrome, I strongly suggest giving this keyboard a try.